Gary Cornish will tonight attempt to become the first Scottish boxer to win the British heavyweight title. The 30-year-old fighter from Inverness, whose only defeat in 25 professional bouts came against the current WBA, IBF and IBO world heavyweight champion Anthony Joshua in September 2015, will put everything on the line at Meadowbank against Norwich’s Sam Sexton (23-3). Given what’s at stake, though, the Highlander insists he doesn’t feel any additional pressure to deliver in front of a partisan crowd. “When I first started boxing my goal was to become British champion. I didn’t realise back then that if I do win then I’d be making history,” Cornish said. “So there’s no extra pressure, nothing has changed and I want to be British champion. 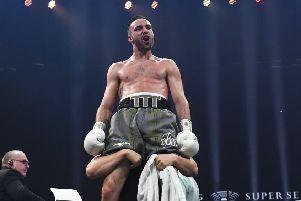 On the same bill, Edinburgh’s Stephen Simmons, who was due to fight for the British cruiserweight title until current champion Matty Askin withdrew from the contest a fortnight ago citing a shoulder injury, will box Kettering’s Simon Barclay for the vacant IBF European belt. But, despite this late change in opponent and title, Simmons, 33, believes he will be in a much healthier position to challenge for the biggest prize of all should he prevail tonight. “I’m in this game for one reason only and that is to win a world title,” Simmons said. “Winning tonight can push me into the top 15 of the IBF world rankings, I’m just happy there is a really good belt on the line. I’ve been in camp for ten weeks so I’m feeling great. “In my mind this is bigger than the British title because a win would move me in the direction of where I want to be. I want to make as much money as I can for my family so I don’t want to be selling myself short.